If you are thinking about a data migration from one Help Center to another, upgrading or consolidating, Helpando makes it easy. And risk free. Customers might refer to tickets from the past and your agents need access to these tickets. Agents get an overview of a customer’s entire ticket history. We assist in migrating data (and databases) between any cloud-based ticketing solution such as Zendesk, Desk.com, Kayako, OTRS, Heat, Freshdesk and many more. Even if your system has no API you can send us a SQL or POSTGRES dump or a file with CSV data and we will migrate it into your new system. 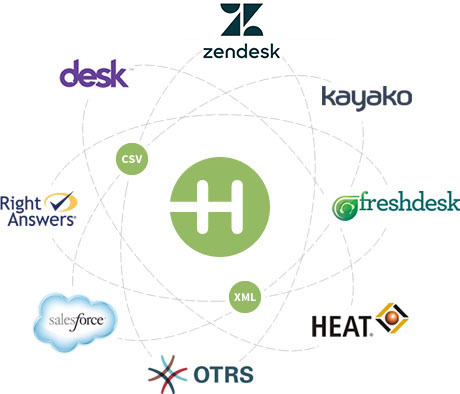 With Helpando, your Zendesk data migrations are guaranteed to be risk free. We’ve migrated tickets and data for hundreds of clients, some of which were Fortune 500 companies. Exceeding expectations is our goal. Unsure about what you need? Are you worried about losing your data? Want to talk to one of our reps? Contact us and let us explain how we guarantee any ticket and data migrations will exceed your expectations. Interested in a data migration? If you’d like to read more about Zendesk migrations, check out our post about The Basics of a Zendesk Migration.